I have discussed in these columns some days ago the contention that President Rajapaksa is not qualified to fight an election for a third term by virtue of the operation of Article 31(2) of the Constitution. The repeal of that article by the Eighteenth Amendment does not remove the past operation of anything suffered under the repealed law. Since ex-CJ Sarath Silva first raised this issue, lawyers and non-lawyers have tried to make the case that Sarath Silva is wrong and that President Rajapaksa is not prevented by the Constitution to seek a third term. I have pointed out, and so has Suri Ratnapala, that the relevant section of the Interpretation Ordinance to look at is section 6(3) (a). Yet, some commentators have relied on another section of the Ordinance, namely section 6(3)(b), and have argued that it does not apply to President Rajapaksa as he has not acquired a ‘penalty’ under that section! It is an argument that suffers from the fallacy of the false premise. In this article I will deal with some of the other arguments that have been advanced to support the position that President Rajapaksa can seek a further term. I will also highlight some of the basic principles that militate against a Rajapaksa third term. One such argument is based on the supposition that in all countries except the USA, including all commonwealth countries, there is no limit on the number of terms a president could serve. But, in truth, term limits have been imposed by most of the constitutions where the presidential system obtains. Virtually all the countries in the African continent have constitutions that have prescribed term limits. This is true of countries in the South American continent, too. Nigeria, Ghana, Kenya, South Africa, the Maldives and Afghanistan operate a presidential system with term limits. In Nigeria and Ghana, a person may be elected as president for a maximum of two four-year terms. The Maldives, South Africa, Afghanistan and Kenya all prescribe two five-year terms. There are a few exceptions but they are not worthy of emulation in a democratic country. The Bolivian constitution limits the presidential term to two, although Mr Morales got round this limitation by arguing that he served his first term under the old constitution which had been replaced. Fujimori of Peru controversially ran for a third term in the face of a two-term limit. He got round the limitation by arguing that his first term did not count because he was first elected under a previous constitution. A law was passed to adopt his interpretation that the first term did not count and when the constitutional judges disagreed, he sacked them. Recently, Rossana Favero-Karunaratna in an article drew attention to this saga. The South Korean strongman Syngman Rhee paved the way for his re-election for a third term by first forcing a change to the Constitution which allowed the president to be elected by a direct popular vote. He threatened the National Assembly with dissolution if it did not approve the constitutional change. To push through this change he imposed martial law and repressed all political activity. The Assembly’s vote for the constitutional revision was taken in the middle of the night. More constitutional changes were made to enable Syngman Rhee to enjoy the office of president for an unlimited term. He even ran a fourth time and won with a massive majority. The people of Korea got tired of his rule and found it hard to digest. Ultimately, his constitutional manipulations and misrule provoked a popular revolt leading to his downfall. These precedents highlight the dangers inherent in a system capable of perpetuating power in the same hands without limit. The precedents cited here highlight the importance of adopting – and sticking to – basic democratic traditions and values and having safeguards such as fair elections with a view to promoting succession by peaceful change. The two-term limit was originally entrenched in our own constitution to avert such an eventuality, to deter abuse of power and to ensure a change of guard at the top at the end of two terms. Power when left in the same hands for far too long tends to be abused. It is this fear that provides the rationale for limiting the presidential term. The corollary of this principle is that a change of rulers is desirable for the survival of democratic institutions. Periodic elections are the essence of constitutional democracies and elections are meaningless if they do not facilitate change. Otherwise, the country would be saddled with an elected dictatorship. The 1978 Constitution created the office of a directly elected President and invested this office with unprecedented powers. Significantly, the President was given immunity from suit for the duration of his term in office, his term was fixed and the period when a poll could be called for presidential elections was clearly specified. The rationale for the introduction of an elected president was to insulate his tenure from the vagaries of changing majorities in the legislature and to make it stable. The six-year term and the two-term limit were important elements of the constitutional arrangement pertaining to the terms of his office. The head of state enjoyed immunity of suit under the 1972 Constitution, too, but he exercised only nominal powers; the Prime Minister, who was the real head of the executive, enjoyed no such immunity. In order to minimise the potential for abuse, the 1978 Constitution provided that a person could serve a maximum of two six-year terms and disqualified him from seeking office thereafter. The Third and Eighteenth Amendments interfered with this arrangement. The Eighteenth Amendment entrenched the worst features of the presidential system of government by removing the two-term limit along with the Constitutional Council introduced by the Seventeenth Amendment, which were the only, albeit somewhat weak, checks left on the already powerful President. The Civil Rights Movement petitioned the Supreme Court for a declaration that the amendment required a referendum. Mr Nadesan QC, who appeared for the CRM assisted by Suriya Wickremasinghe and the writer, argued that the fixed term was put in place to secure stability to that office and it was an essential element of the office to which the people had delegated a part of their sovereignty, namely their powers of government. The amendment, by interfering with this arrangement, impinged on Articles 3 and 4 of the Constitution. Therefore, it required approval at a referendum. This is an eminently valid argument because, when Article 4 stated that the executive power shall be exercised by the President, it meant that it shall be exercised by the President holding office subject to the terms and conditions set out in Chapter VII, including Article 31. The Court, presided over by Justice Sharvananda, accepted that the Third Amendment impacted on Article 3 but, because it enabled early elections to be called, it enhanced the people’s franchise, which formed part of their sovereignty. The Court rejected the petitioner’s argument that the Bill gave the incumbent President seeking re-election an electoral advantage by giving him the discretion to choose the most opportune time for election. The instability of the executive that Jayewardene wished to avoid was caused precisely by the power of dissolution of parliament that Prime Ministers acting under the parliamentary system were able to exercise before its term ended. Yet, the Court based its conclusion on the questionable premise that it was an accepted convention of any democratic government that the Prime Minister as an incident of his office was entitled to choose the date of Parliamentary election; therefore the President could do the same. If the Court’s rationale were carried to its logical conclusion and elections are held every year, then the franchise rights of the people would be enhanced even further but that would lead to what mathematicians and logicians call a reductio ad absurdum. It ignored the people’s wish that they did not want any enhancement of their franchise as stated by the Court, which they had indicated by insisting that no elections shall be called more than once in six years. The people did not wish to interfere with the term of the President’s office because they wanted to give stability to that office and required him to give effect to their mandate. They had even provided that if a vacancy were to occur in that office during the pendency of a term, as when a President dies or is removed from office, then it shall be filled by a process other than election. Frequent elections would drain the state’s financial resources and make it impossible for its incumbent to give effect to the mandate given to him. The Eighteenth Amendment interfered with another significant component of the presidential package described above. When the Eighteenth Amendment Bill was referred to the Supreme Court for an opinion on its constitutionality, several persons petitioned the Supreme Court for a ruling that the Bill required approval at a referendum. They argued that the Bill required such approval because several of its provisions were inconsistent with basic provisions in the Constitution which engaged the referendum. It was argued in particular that the removal of the term limit would affect the manner in which the executive power of the people would have to be exercised. It is apparent from the Court’s opinion that it had dealt with the petitioners’ arguments in a rather cursory manner. No attempt was made by the Court to identify in sufficient detail the arguments that were presented to it. The Court failed to appreciate the degree to which its interpretation would fundamentally undermine the terms subject to which the office of President had been created and to which vast powers had been delegated. The Court failed to consider the impact that the Amendment might have on the terms subject to which the people had delegated their powers of government to the President. The Court referred to the impact the Amendment had on Article 4(e) but did not give its mind to the impact it had on the powers of government mentioned in Article 4(b). The Court’s misconceived and misplaced emphasis on Article 4(e) led it towards an erroneous interpretation. The Bandaranayake Court had an opportunity to correct the errors made by the Sharvananda Court but it proceeded to make the same errors because it adopted the same faulty reasoning and logic as had been adopted by its predecessor. The Court in both instances failed to appreciate the drastic consequences that these two amendments might have on those terms of the office that were fixed in order to prevent abuse of power. In fact, the Eighteenth Amendment represented a multi-pronged attack on those Constitutional provisions which were designed to operate as a check on the enormous power given to the Executive. Asanga Welikala has noted in an article elsewhere the indecent haste with which the Eighteenth Amendment Bill was rushed through the Court and Parliament as an urgent measure. It is impossible to understand the urgency behind the introduction of the Bill. The President had been re-elected only a few months before and there was no prospect of any election for about four more years; the people would have been tired of elections and the thought of elections would have been far from their minds. Such haste had the effect of preventing a fully informed debate taking place on the Bill’s merits. Indeed, the petitioners who intervened in Court were not provided with accurate copies of its text until after the Attorney General had commenced his submissions to Court. It is almost certain that no submissions were made on the Bill’s effect on the president’s immunity from suit. Both the Court and the lawyers who appeared before the Court were placed under severe constraints and had inadequate time to gain a proper insight into the Bill’s purport and its ramifications. Consequently, the Court did not have the benefit of an informed discussion on the Bill. To compound the matter, the Court performed the extraordinary feat of pronouncing judgment on the Bill’s constitutionality within a day. Not much discussion took place in Parliament. Many members absented themselves from Parliament when it was taken up there and members who did attend must have had their minds occupied by other urgent matters affecting their electorates rendering them unable to make a careful study of its contents, to understand its consequences and to make meaningful contributions, especially with the three line whip hanging over them. I have made these points to emphasis the fact that the Third and Eighteenth Amendments went against the original intent of the Constitution. The Supreme Court has failed time and again to realise that the judicial power that is reposed upon it is a power that has been delegated to it by the people. The Court has a responsibility to protect the fundamental values which the people have enshrined in their constitution and to ensure that neither Parliament nor the Executive shall encroach upon those values. When the Court was called upon to examine the Eighteenth Amendment Bill it had an opportunity to correct the errors that were committed by a previous Court but it failed to grasp that opportunity and gave in to the wishes of the Executive without much demur. It remains to be seen whether the Court would rise up to the occasion if and when an opportunity presents itself to undo its failings. Regardless of the missed opportunities of the Court and Parliament to make amends, President Rajapaksa is prohibited by the Constitution from proceeding to a third term. The repeal of Article 31(2) by the Eighteenth Amendment does not remove the past operation of the disqualification he had suffered before that Amendment. Civilisations Have Clashed: Who Will Rebuild? Only if they follow the constitution and the law. Will they? make it diificult for MaRa aka mara. The decision to announce a sudden presidential election on the 17th of this month or thereabout has been suddenly changed reveals a reliable source. President Mahinda Rajapaksa has two more years to complete his second term in office but there was speculation that an illegal presidential election would be held suddenly. The JVP with the former Chief Justice and other people’s forces had commenced a massive protest campaign against the illegal and unethical presidential election to be held prematurely. The government has been concerned as several political parties and groups were supporting the move to oppose the illegal presidential election. Also, legal experts including the Bar Association of Sri Lanka (BASL) have pointed out that President Mahinda Rajapaska has no legal right to contest for a third term. The Parliamentarian of the JHU Ven. Athuraliye Rathana Thero too had said every possible step would be taken to defeat Mr. Mahinda Rajapaksa if he calls a presidential election without amending the Constitution. 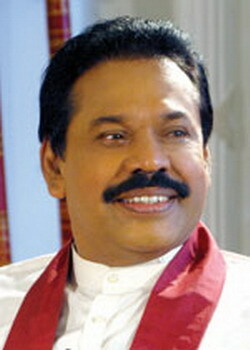 As such, an environment has developed in the country against a sudden presidential election, the government carried out a secret survey which has confirmed that the popularity of President Mahinda Rajapaksa has decreased considerably and an opposition to him is developing rapidly. The government that has been concerned regarding the situation suddenly decided to put off the move to call a sudden presidential election says the source. Brilliant.After all you have been with Mr.Nadesan Q.C. Mr.Nadesan QC.in his article ;some comments on the The Cnstituent Assembly and the Draft Basic Resolutions made Dr.COLVIN quite uncomfortable. Unfortunately,we do not have lawyers of the calibre of S.Nadesan Q.C in our midst.However,we have lawyers of your calibre in the exposition of the Legality of the Third Term.Thanks. A lot of people, including my own-self, did not like what JRJ did by introducing EP under 78 constitution. However, to a great extent he was a fair man and had gentleman qualities close to heart. It was very JRJ he who could have gone for a third term had he wanted (for the greed for power) to do so before anyone else. Why did he not do it? He knew that 12 year period allowance for one person to develop a country is more than enough. If the elected does something with a correct vision to achieve positive result for the country it’s a sufficient time. Everyone else came to power after JRJ maintained their as a principle even irrespective of what they’ve done. Also it is noteworthy to mention that non of those who were the previous presidents did not go that far to operate a state run mafia by manipulating the system. MR is an ungrateful man. He ate tons and tons of rotten ropes from racketeers. He has messed up the entire thing as a result of no-knowledge or common sense. He has a crooked and a cheating mind. Everything that he is going to do from now on will go against his own self. He is the stupidest man to rule a country. Poorer countries like South Sudan, Ethiopia, Somalia has more intelligent and honest rulers than MR. In my own experience I know he don’t like good, honest people to serve the country and people. He only like crooks and mafia type bastards! That is why the country is in such a dangerous point of anarchic environment and that is why people must use their heads to protect the country than anytime in history ever wanted to stand up together. This what Anura DIssanayake told couple of days ago. MaRa uses thuggary even to control his own men. MaRa will somehow fool the village folks to get votes and win next election. What a tragedy…..
“Today Ministers are too scared to speak out. There are 28 files pertaining to allegations against Ministers at the Bribery Commission. If anyone makes a noise, they will start opening the files”, MP Dissanayake said. He said that Minister Champika Ranawaka had started to make some noise over alleged corruption in the government but since then he too has become quiet. Senaka De Zoysa Sirwardena, surprisingly Mahinda Rajapakse has not always been this corrupt. There was a time when he was a respectable Human Rights activist. Power corrupts and absolute power corrupts absolutely. Also the senior D A Rajapakse, commanded much greater respect than these siblings and the other Rajapakse relatives in power. This gave me a headache…BUT a clear and concise analysis and well worth the headache. Thank you! I wonder how Article 31(2) could have been missed when Clauses of a written Constitution were being studied in detail and thoroughly analysed to perpetuate the term of Presidency beyond the 2 term limit. Was it a hasty slip-slop job done by Constitutional experts, which now has come to haunt the Presidency, and may even cost him his ‘illegal’ third term. Prof GL should be sacked, I can hear him swear. For fact we now know that the 17th, 18th or whatever new Amendments to the Constitution could only be formulated after such a thorough study had been made. We also now know SNSilva either knew all along, or, recently discovered these oversights, and waited for the opportune moment to come clean. Anyone have any inpit on how these glaring oversights are let to happen? Are these genuine man made mistakes? When surely, all the King’s men who sat at that round table couldn’t have been fools? They had to be the best Constitutional Lawyers that the country had produced. That picture above is the President of Sri Lanka. Is he stupid to worship trees and stones? This is exactly what Lord Buddha exhorted against. Even this stupid man’s wife could have told him, if you really want to, then worship your Creator, not the creations of the Creator. No, he wants to cheat his stupid voters. He could have got better results had he chosen to kiss the dicks of those yellow robes. Ha ha. These acts are drama’s to fool the sinhala masses!! The headline should have been Kissing the trees and killing the people!! Well, what more to say than this, Excellent work by Dr, Reeza .This is more than an article with analysis made from every angle.The picture speaks the truth of the present situation in SL ..diverting the attention of the people! I wonder if the previous courts or the CJs have indeed been biased in their pronouncements. An excellent and interesting article, which laymen could understand with ease. Thanks Dr. Reeds Hameed.